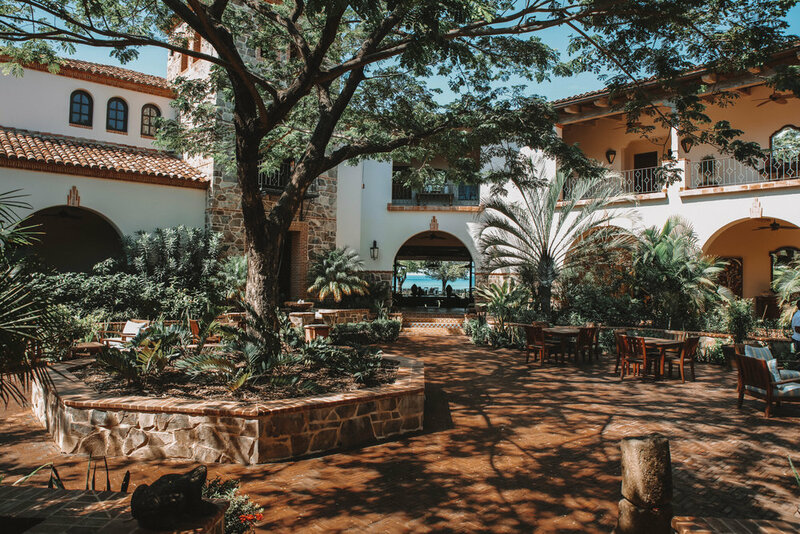 During our trip in Nicaragua, we were fortunate to experience a few days at Rancho Santana, a Resort and Residential community located on the Pacific coast of Nicaragua. 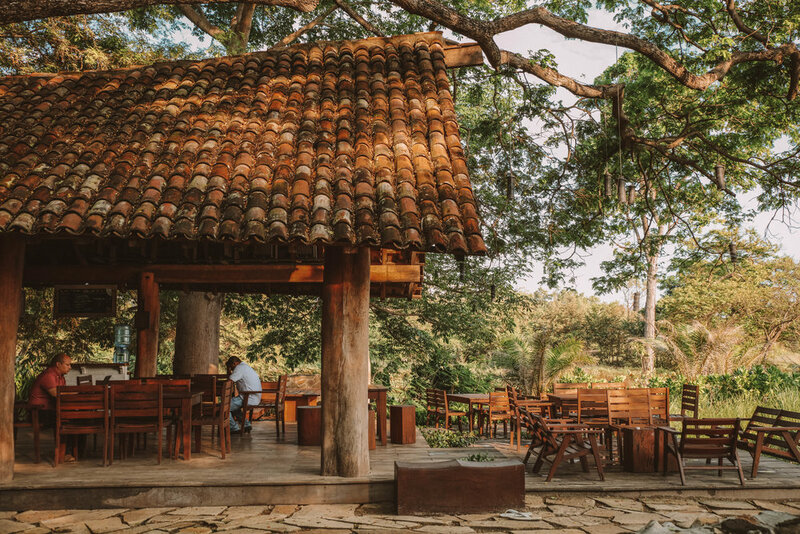 Although this had been the third resort during our trip, this place in particular made us 'feel' like we were experiencing the raw natural beauty of Nicaragua. We felt so tranquil and peaceful the moment we arrived. The community and Resort spreads over a whopping 2,700 acres - and boasts rolling hills, dramatic shores which are broken in between five STUNNING beaches; Playa Santana, Playa Rosada, Playa Escondida, Playa Duna, and finally Playa Los Perros. Inside the Rancho Santana property, we were staying at The Inn - in a gorgeous en-suite bedroom with a balcony that had incredible views of the pacific ocean. Every morning we would open the curtains, stand on the balcony and breath in the salty air looking across the stunning garden. Everything about this resort was tranquil and peaceful. Our bedroom and bathroom were well equipped with all the necessary essentials, i.e. hairdryer, iron and bathroom products. Inside every bedroom of the Inn, they provide you with an Ipad which hosts their Rancho Santana app. This app shows you various things they have on offer, i.e housekeeping a map of the Resort, or even signing yourself up to receiving an alert on your mobile about turtle hatching on the beach! We found this Ipad incredibly useful to our everyday plan whilst at the Resort. Inside the resort, they have two Clubhouse with pools that are reserved for the exclusive use of owners and guests of the resort. The second pool house was being renovated whilst we were there, so we chilled by the beautiful oasis of a pool at The Inn. I am a serious foodie and LOVE rustic, traditional meals; so when we sat down to eat at the restaurant inside The Inn, I was pleasantly surprised to see they served traditional simple meals with a unique and tasteful touch. All fruit and vegetables are grown from their own organic garden & seafood is freshly delivered by the local co-op of fishermen. Every morning we would indulge in a full blown American - style breakfast, accompanied with a healthy smoothie to make us feel slightly better about ourselves! On the Rancho Santana property, there is a little store, called La Tienda. This store is BEYOND convenient and has all those little necessities you might forget - i.e a hairbrush ;) !! La Tienda also offers freshly served salads, pastas and wraps - kept refrigeratored on a daily basis. We had one day trip to Ometepe, so we stocked up at La Tienda before hand, to take along bits for our breakfast. There are lots of activities to do on the ranch, but the most obvious and popular one would be riding. We took full advantage of this opportunity and rode with two guides for 1h30 minutes. This is a wonderful way to see Nicaragua, and however English I may have looked on Senorita (my horse), I felt very much the local! The riding is very different in Nicaragua that riding in the UK. For starters, you don't have to wear jodhpurs and a helmet, I wore shorts and a t-shirt (don't recommend shorts, my legs rubbed) and we didn't have to wear a helmet. The horses are also trained differently, they're super relaxed and respond to the simplest instruction by holding the reins in one hand and moving it left and right to direct them where to go. We found the whole experience a breeze and had so much fun riding along the beach. However, if riding isn't your gig, the Resort also offers a spa, yoga, paddle boarding, surfing and hiking tours. We had the most divine and restful LAST few days in Nicaragua, and that was all down to the amazing Resort - Rancho Santana. Every staff member at the resort, was beyond kind and accommodating to our daily needs and questions. We do hope to be back one day!